I thought I had a few big weeks a ways back, this week was bigger and a lot more work – my triceps and biceps are still trashed a week later. 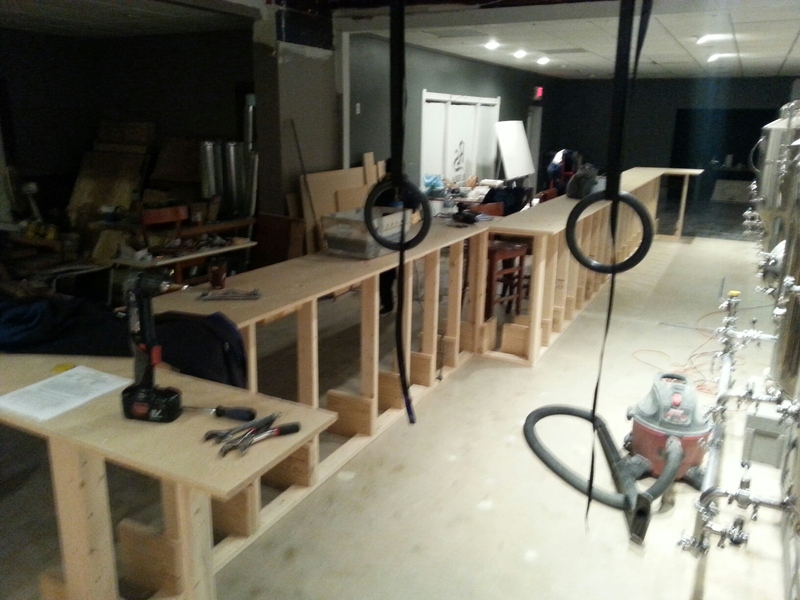 This week we started the bar. It’s a big bar with about 18 seats. 40 foot straight bars are a little more difficult than shorter ones as with several long, straight runs, you want to make sure that it can stand up without bending and falling over. What makes this more ‘unbalanced’ was that I wanted 16″ of table on the patron side and only 4″ behind the bar…so very unbalanced requiring much support. 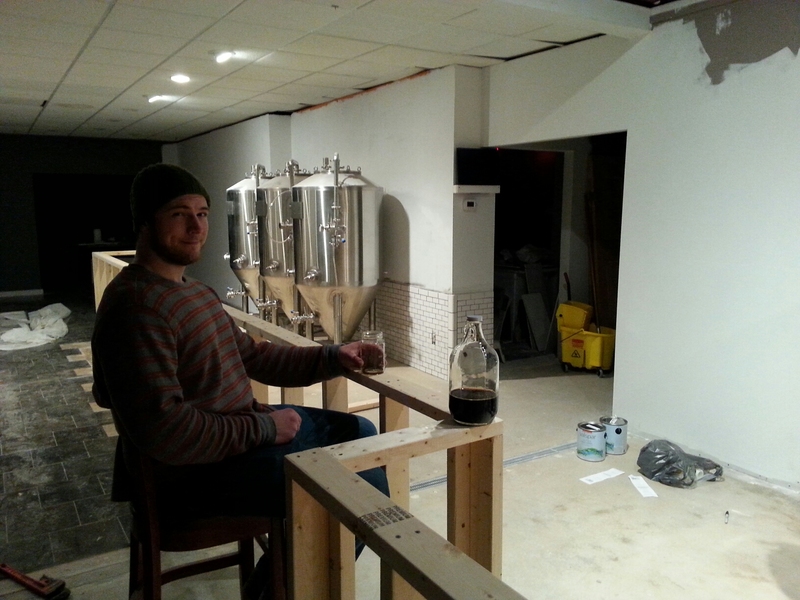 I came acrossed Meniru Meadery’s page, a meadery that is expanding in Canton. 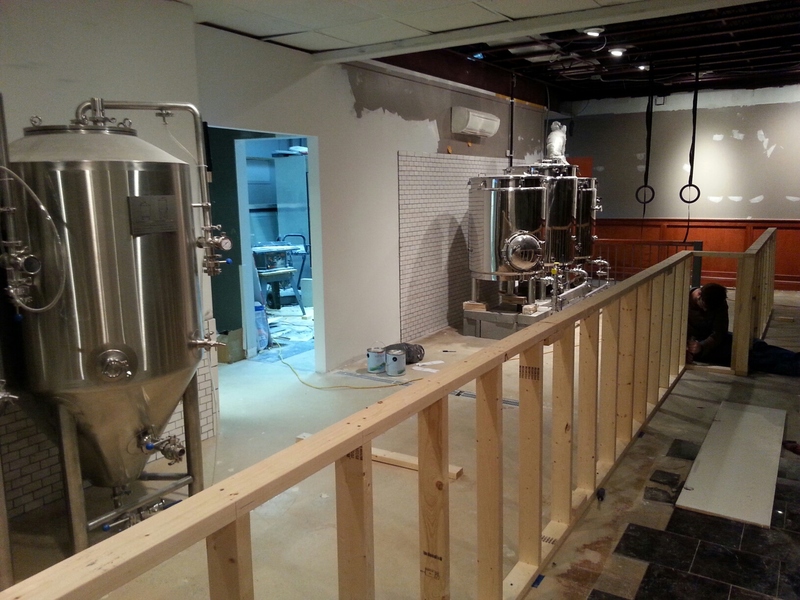 They showed some pics of building their bar. It was just what I needed, I wanted to see how they supported it. I browsed some other home bar builds on the web until I knew exactly how to build it. *Now, I don’t know how I want to finish the bar, so I had to build it knowing that I still needed the final layers. My Dad and I took another trip to Lowe’s to load-up on 4×8 sheets of 3/4 inch particle board, 1/2 sheets of plywood, lot’s of 2×4’s and a few 2×12’s. Now the last time I worked with particle board was when I was a kid – particle board was the wood of choice when building subwoofer enclosures to dampen any wood resonance. I built several for the trucks that I had back then. I forgot JUST HOW HEAVY those things are. 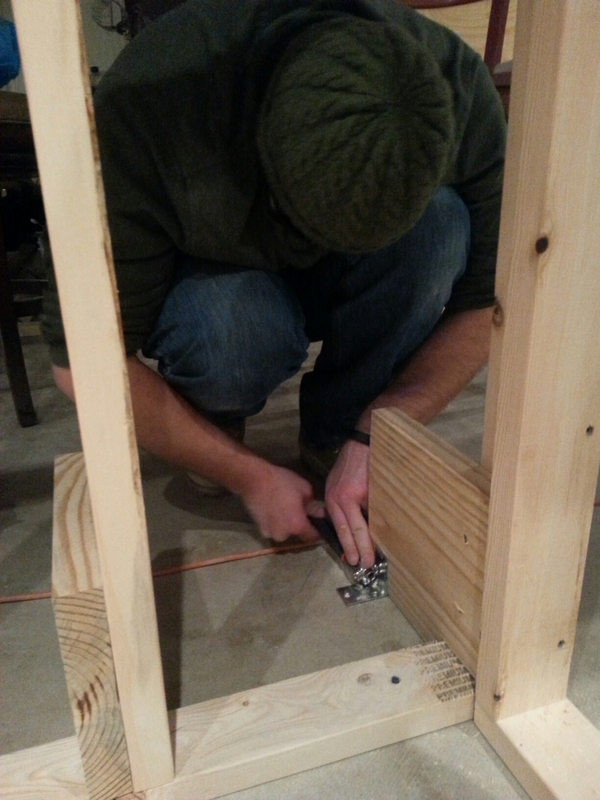 I called Jesse and he came down for the next two nights to start building this thing. Before he came my wife and I rebuilt the mockup-bar and took measurements again to make sure we got this right. 42″ tall with an 8″ wide by 10-11″ tall square footrest. The table overhand will be 16″ with 4″ on the backside. I sat in it. She sat in it. I later had Jesse (tall) sit in it before we started cutting wood. 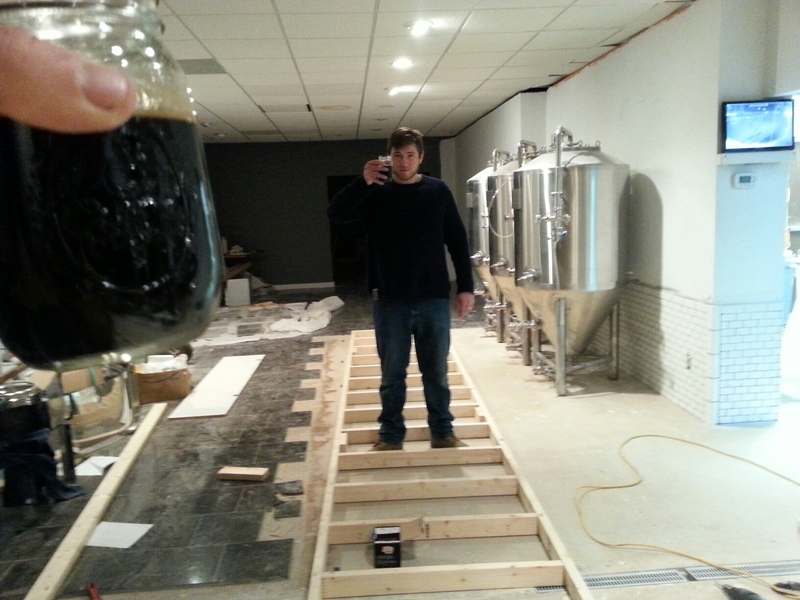 I was confident that these dimensions will lead to a very comfortable bar. 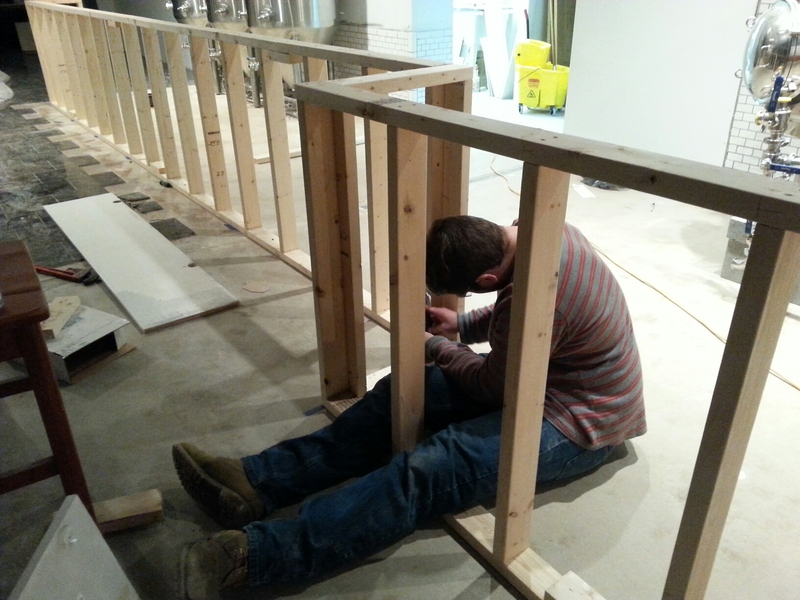 We started building the wall of the bar first, making all of the cuts at once. 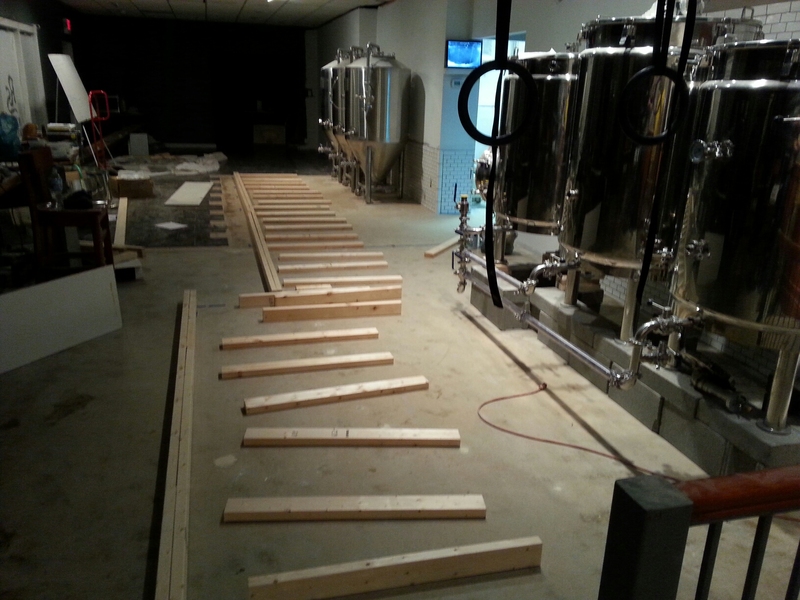 We staggered the 2×4 headers and footers. Break time already! I sent Jesse over to Eli’s at Trailhead for a growler of stout. Now, I like to be able to take things apart so we screwed EVERYTHING together. No nails at all. 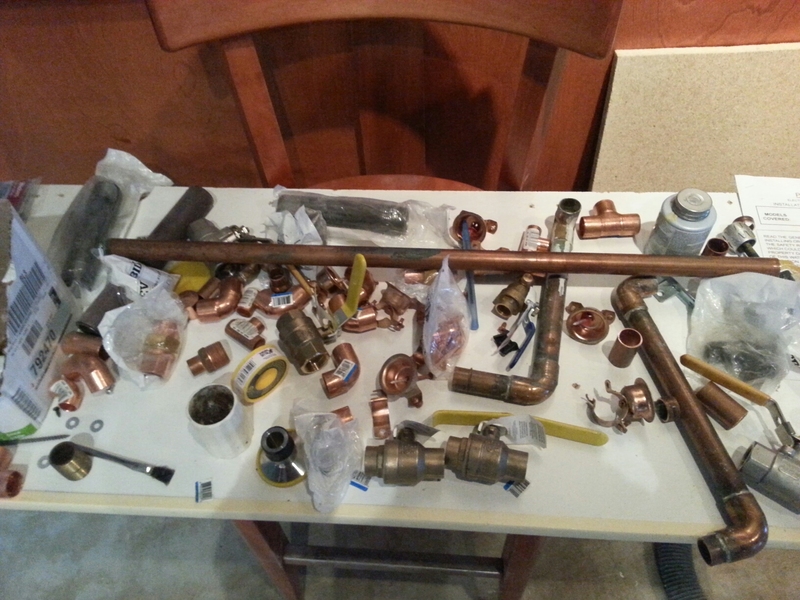 This is what trashed my arms….two days of this…just constant force. We anchored the footer into the concrete every other stud with large anchor screws that we had to drill. The backbone is up, time for another break! The above ended up being the easy part. Next was cutting the 2x12x8’s into footlong pieces then cutting them to width AND THEN notching them. 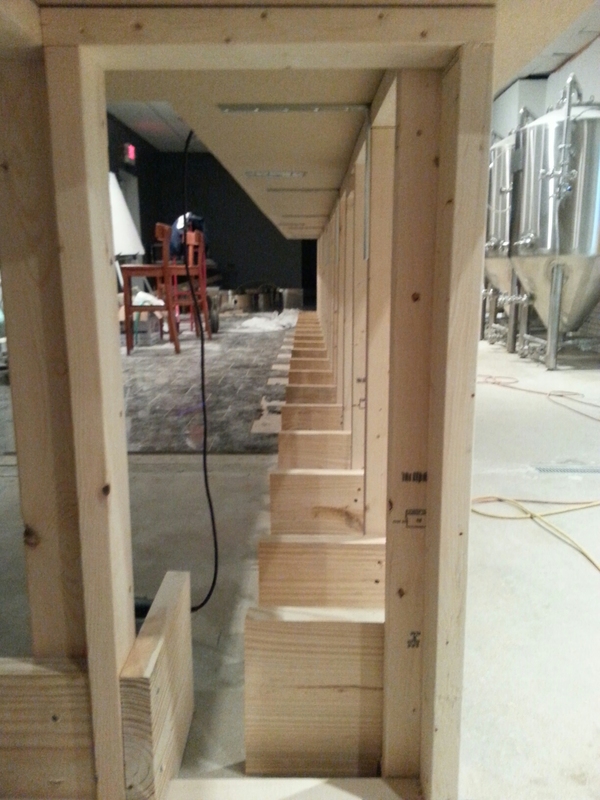 We screwed these into the bar wall with long decking screws and had to make sure every 2×4 we attached to them to was level. These are the footrests ‘ribs’ which are actually very important for the bars lateral rigidity. We also anchored every other into the concrete floor with metal angles. 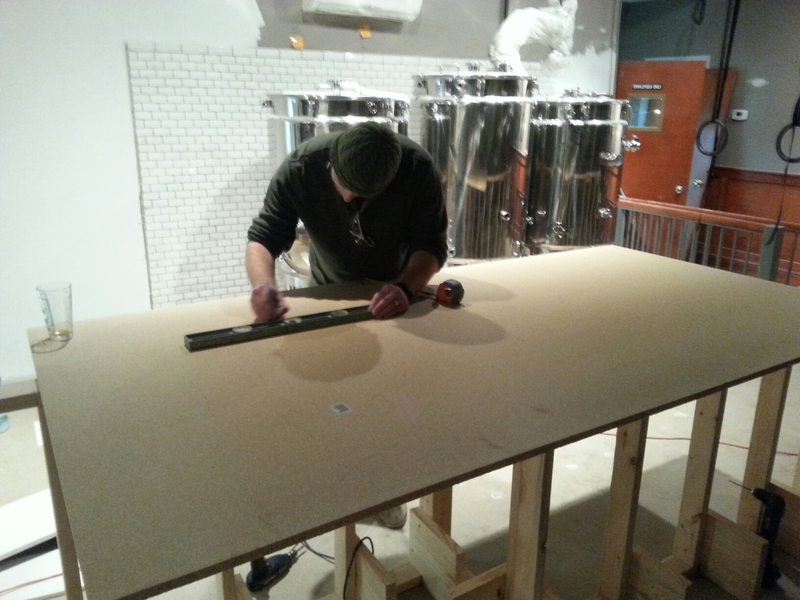 We then worked on measuring and cutting the bar top, first layer. 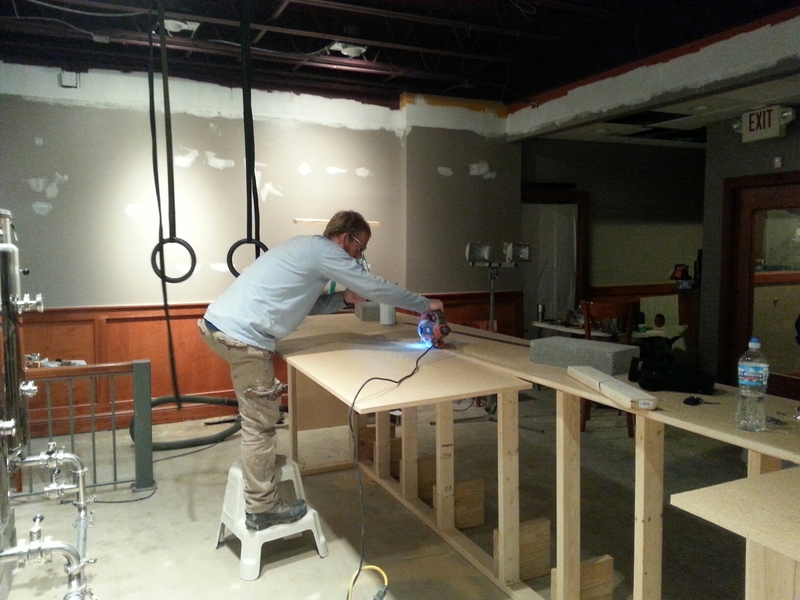 Large metal angles also provide support for the bar top. 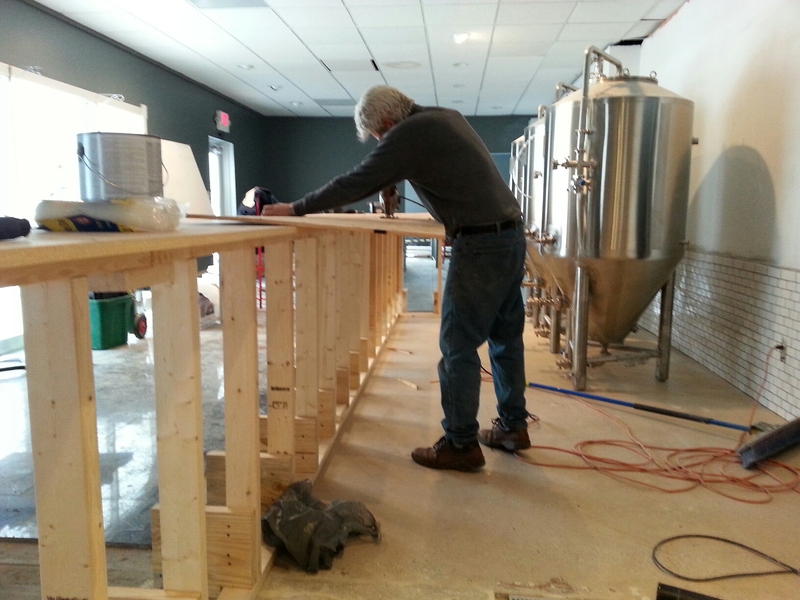 Dad working on finishing the first layer of the bar top while I paint. It was amazing how the bar strengthened after getting the top on. 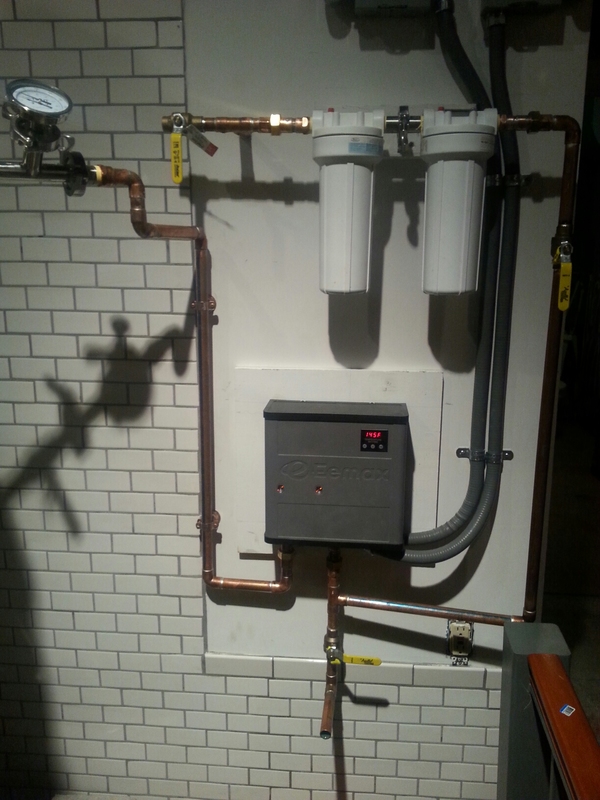 The Eemax on-demand electric water heater got installed so I had to plumb it to my brewing equipment. I would have had it done before it got installed but ran out of time doing the bar. I actually LOVE soldering. It’s slow and painstaking, but very satisfying. 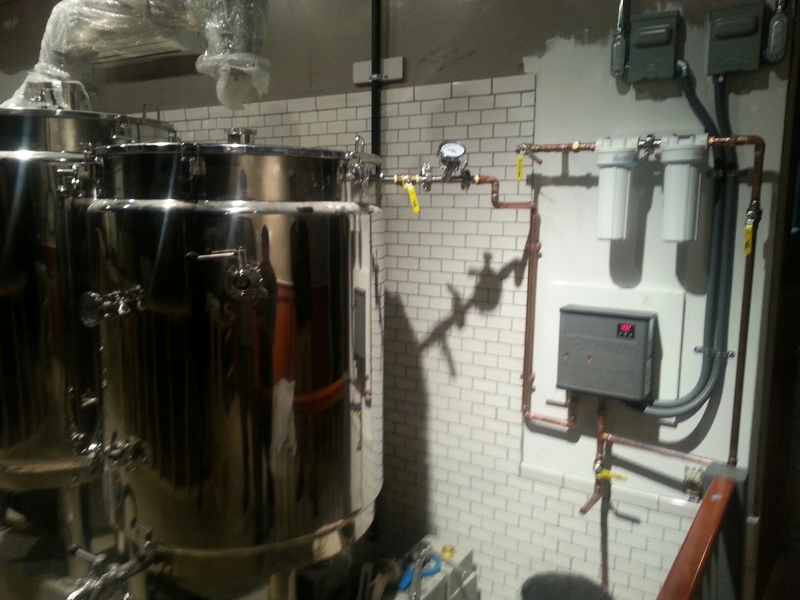 All ready to go – the ‘heart’ of the brewery. By this time it was late at night, all my Dad and I did was to check for leaks. Ironically I had ZERO solder leaks but some of the unions needed tightened a lot more. I needed a lot more teflon tape on some of the threaded joints too. We turned on the Eemax and got hot water!!! 40ish degrees to nearly 140 degrees will save a lot of time and unnecessary heat. 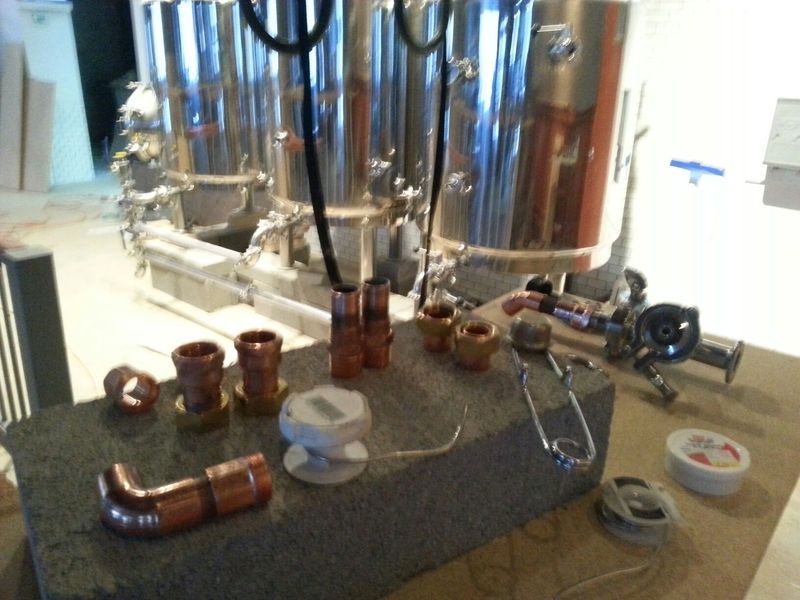 To any brewers, this is a hybrid electric/gas system. In theory, an hour before I start brewing, I start the water through the Eemax. It will take about an hour to give me 60-80 gallons of 120-140 degree water to start the brewing. As it’s going into the right tank (hot liquor tank-HLT), I also have a small 12″ mini-jet burner under the HLT that is heating it up to finish it to 170 degrees. I have to run some tests to see how well this works. I may be able to shorten or may have to lengthen the cycle. I wanted to eliminate solely relying on a burner as that will put way too much heat into the air requiring a much more aggressive ventilation system. I am trying to keep the ventilation very minimal. Time to get some color in this place! 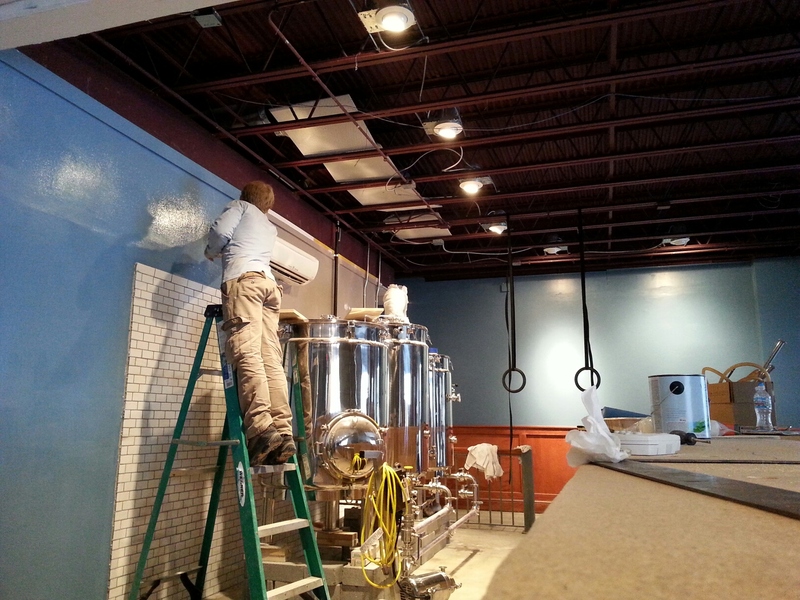 I started the painting…only behind the brewery where you will be sitting looking at. I want to make sure the color is right. This will NOT be the color. It came out looking wrong….too powdery blue – not dark enough and not grey enough. I also don’t like the semigloss with the lights – I need a flat/matte finish to absorb the reflections. I will be repainting this soon. Run several Eemax/HLT water heating curves. Make sure the burner is adequate. 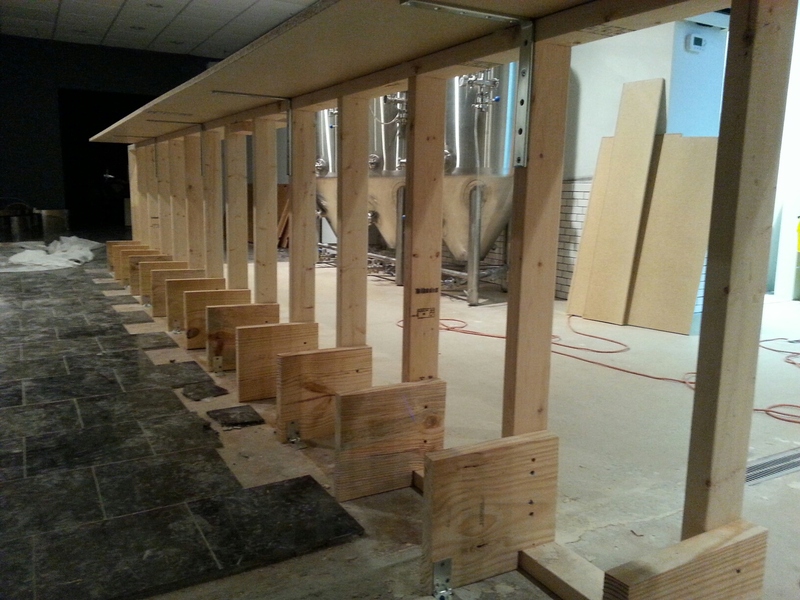 Put the first layer of facing on the bar wall and footrests. 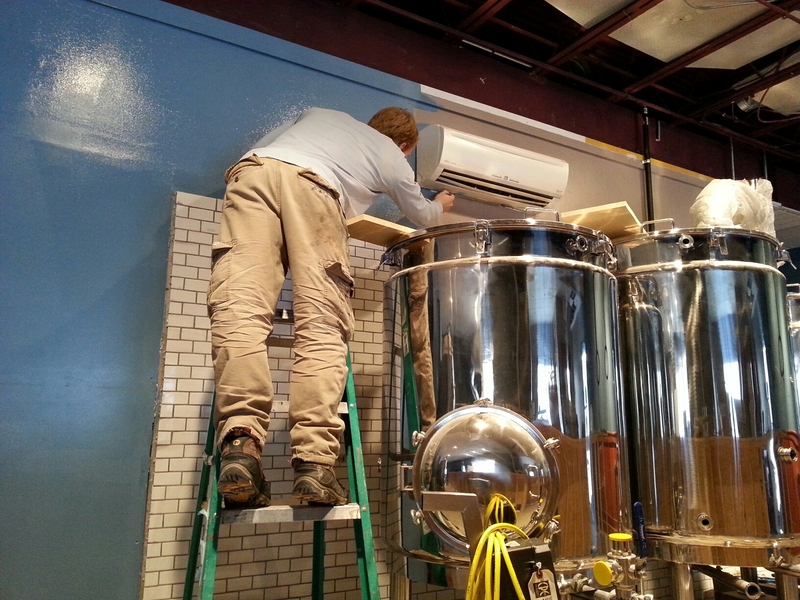 Order large fermentor glycol system. Order draft tower, trunk lines and dispensing equipment. Jesse. I’m sure his arms got trashed too. Thanks for driving down in the snow to help with this and getting back home way past your bedtime. Dad. Dad helped a lot with the bar top – checking for straight edges and levelness and getting it cut. The kids. They spent a night with ‘big red’ to vacuum up our mess. My college ‘Statics’ class at Akron U. It was my dabble into engineering but it provided me with good intuition on stresses and torques on joints which I applied to making this a solid bar. I have to give thanks to Eli at Trailhead this week. Bringing my own beer in a growler never was at the top of my mind in the afternoon. Luckily there is another brewery about 50 yards away! And I’m never too quick on returning growlers and glassware…thanks Eli. Odd question , but here goes … What’s up with the rings ? To low for muscle ups . Are you knocking out some dips during your breaks too? The rings…I had them hanging in my finished basement…but it’s too full of stuff to move. The roof trusses at the brewery are perfect! I used to lift for a long time but after too many trips to the chiro from favs like militaries and squats, I then transitioned to ring and ‘static hold’ exercises from ‘Building the Gymnastic Body’ http://www.amazon.com/Building-Gymnastic-Body-Gymnastics-Strength/dp/0982125305 – I never looked back. No more pulled muscles and fewer exercise-related back issues. I’m functionally stronger than I have ever been. If you are interested, let me know and I can show you more.